ADULT: Wingspan - 63 - 68mm (male); 67 - 75mm (female). 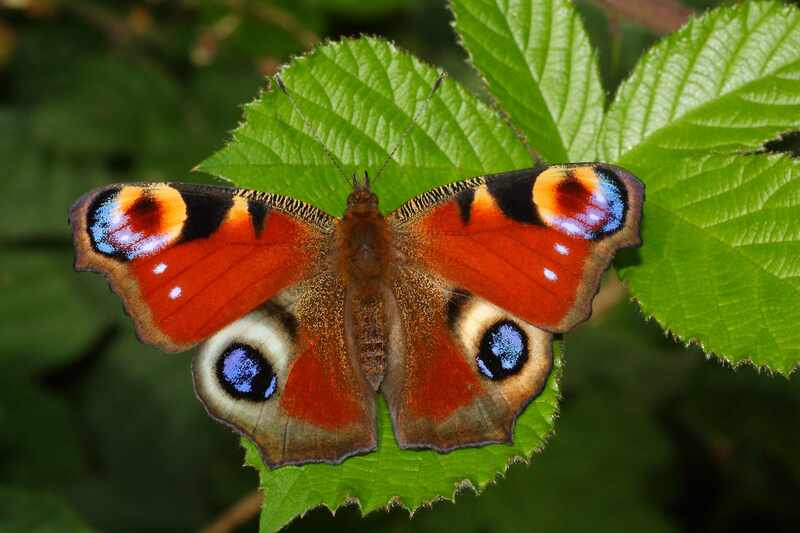 A very distinct butterfly with a striking maroon upper surface, sooty brown margins and a stunning eyespot on all wings of cream and iridescent blue. The hindwings eyespots are bordered by a dusty grey. The undersides are dull sooty brown and provide excellent camouflage. CHRYSALIS: 25 - 30mm. Yellowy-green with variable brownish, gold or pinkish marks and located hanging from the stems or leaves of nettles. LARVA: 42mm. Velvety black and spiny located within a leaf-web on the leaves of nettles. See Pic. EGG: Pale green, oval and located on stinging nettles. Hatching time within 14 days. BEHAVIOUR: A wandering nomad that is immediately recognisable. Males are territorial and see off intruders and excitably chase females. The courtship flight is made up of various twists and turns. The eyes are flashed at potential predators and are occasionally coupled with a hissing sound that comes from the forewings inner margin rubbing against the hindwings costal margin. HABITAT: Almost ubiquitous with preference for meadows, hedgerows, gardens, parkland and dunes. FLIGHT PERIOD: March - October.